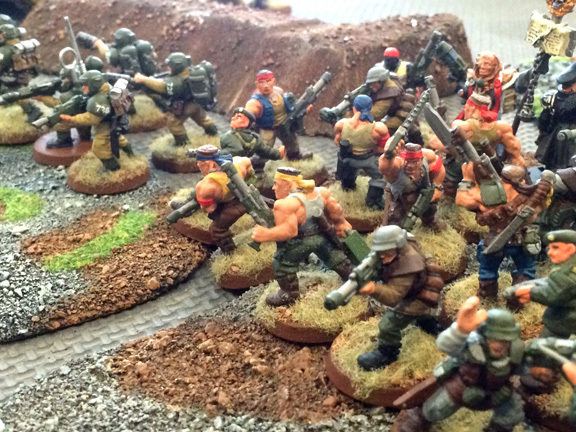 Imperial Guard and conscript militia form a ragged firing line in the battle for the strategically important Barad Mine. Barely visible in the top-right corner can be seen the back of Imperial hero Commissar-Major Rael Dracos. 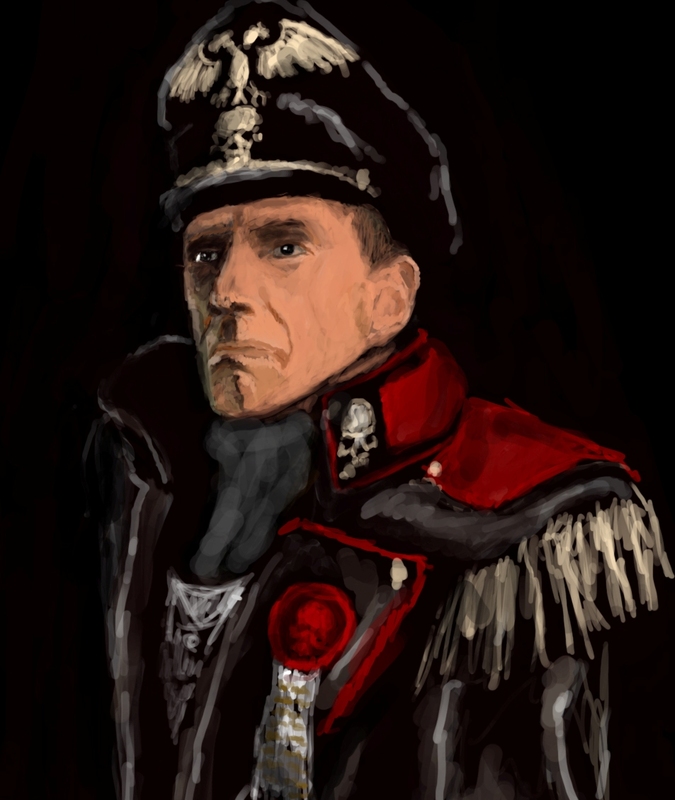 As Commissar-Major Rael Dracos pulled himself to his feet, he knew the battle was lost. The last thing he remembered before losing consciousness was a huge ork smashing its battle axe into his chest. Despite his carapace armor, the blow knocked the breath from his lungs and sent a lance of pain through his chest. Then … blackness. Only seconds before, it seemed, Dracos had been surrounded by conscripts—poorly trained and terrified to be on the front lines. Put behind fortifications in the hopes that their resolve would be strengthened, the troops had fired fired volley after volley at the vast horde of greenskins that was before them. Then the xenos had charged, advancing on the soldiers while bellowing an animalistic roar of rage and bloody-minded madness. Many orks fell, but many more reached the fortifications—and then the slaughter began. Men were torn apart with blade, tusk, and claw. Now Dracos was alone. No doubt his prone form had gone unnoticed amidst the dead. He put a hand to his throbbing chest and looked around him. He saw nothing but corpses, a few orks but mostly men. Hundreds of lifeless men. Gunfire, screams, and the constant roar of orks sounded to his left, and as he looked in that direction, he saw a tide of green surrounding the regimental command post, the last apparent bastion of Imperial defenses. Thousands of orks were swarmed around a tiny circle of Chimeras, interspersed with thin firing lines of desperate—and doomed—troopers. It’s a fiasco, Dracos thought, looking elsewhere on the battlefield and seeing only small knots of Imperial troops retreating into the distance. We’ve lost yet again. First the Iron Spires. Then the Tarak Mines. Is Hegira lost? “Form up! Form up, guardsmen!” he heard. One hundred meters behind him, he saw a young lieutenant struggling to form a ragged band of survivors into an organized force. Draco stumbled toward the men. As he walked, he listened to the sounds of battle. There was plenty of lasgun fire, he realized, but it was ragged—and drowned out by ten times the number of xeno weaponry. It was what he didn’t hear that told the scale of the disaster. There was no roar of battle cannon. No ugly “thump-thump” of heavy bolters firing into the enemy ranks. No sound of mighty battle cannons roaring with righteous thunder. If it would serve any purpose, we’d fight to the last man, Dracos thought. But I won’t waste men on a lost cause. What was the ancient saying? Discretion is the better part of valor? He finally reached the lieutenant and the two dozen men he’d managed to gather into a coherent force—and returned the nervous salute they offered. An empty threat, Dracos realized. Running is a time-honored response for a trooper who has seen his superiors make a mess of things. Still, perhaps the thought of a firing squad will persuade some men to maintain military order. They’ll need their wits to make it across the desert. The next 12 hours was a horror—an exhausting march interrupted by sporadic attacks by small mobs of orks still eager to spill blood. It was spring in Hegira and, at night, the air temperature dropped below freezing. The wounded died first; then the weak. Despite the ache in his chest, Dracos kept moving one foot forward, then another. Many times he wished to simply lie down and let darkness take him. But he kept going. So did many other men. The regimental command post held out for two hours, drawing the bulk of blood-crazed xenos into a horrific battle of attrition that could only end in defeat for the brave guardsmen—but that bought crucial hours for those fleeing for their lives. That time still wouldn’t have been enough. But, once night fell, many of the xenos lost interest in chasing the defeated, and those that did pursue were discouraged by bombing and strafing runs by Valkyries equipped with night-fighting auspices that allowed them to identify ork targets by their body heat. Eventually, even the most blood-frenzied orks gave up the chase and, with the dawn, a column of Chimeras appeared over the horizon to take Dracos and his men to safety. Almost 2,000 men—or 15 percent of the original Barad Mine defense force—were eventually rescued. Click here to read the battle report of the Imperial defeat at the Battle for the Barad Mine. The Corvus Cluster is a hobby blog chronicling our adventures in the Warhammer 40K universe of Games Workshop. This is great. Realy enjoyed the read but Id love to see more pix for each post.